Fibrosis is the formation of connective fibrous (fiber-like) tissue in an organ. Dense, firm scar tissue that forms as a result of disease or injury. (Reminder: the skin is the largest organ of the human body). Pneumoconiosis, a chronic condition resulting from inhalation of mineral or metal particles. 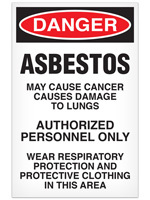 Exposure to asbestos and related materials can cause pulmonary fibrosis (scarring of the lungs). In the context of MSDS's, fibrosis usually appears with respect to potential lung damage or disease. When working with materials that create dusts or can irritate the lungs, always wear proper protection such as dust masks or respirators if engineering controls and ventilation are not sufficient/feasible. What Is Pulmonary Fibrosis? at the Pulmonary Fibrosis Foundation. Pulmonary Fibrosis at the American Lung Association. Pulmonary Fibrosis at the NIH's MedlinePlus encyclopedia. Cystic Fibrosis, a multipage resource at the Mayo Clinic. Get your signs, labels, and respiratory protection products at Safety Emporium.